Luka Modric is now preparing for the new season at Valdebebas and Real Madrid are set to meet with the midfielder’s representatives on Friday to discuss the speculation surrounding his future. La Gazzetta dello Sport reports have rocked the boat in the Spanish capital, with the shock announcement that the Croatian is the subject of serious interest from Serie A giants Inter. 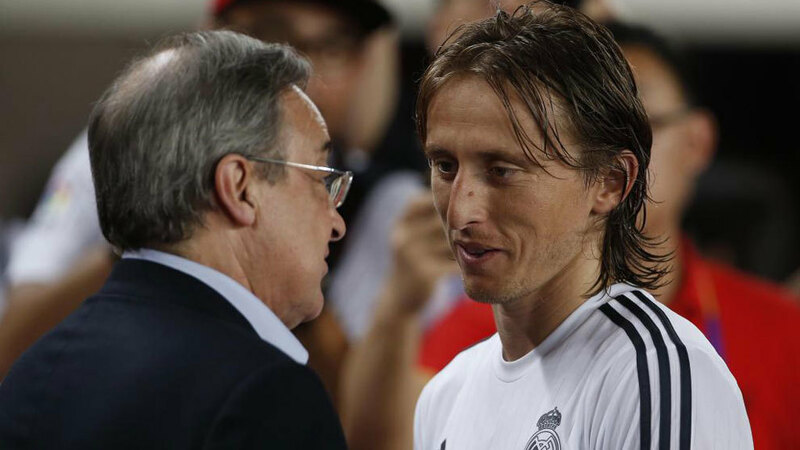 Such a situation initially led to Real president Florentino Perez dismissing any negotiations with the Milan outfit, pointing towards Modric’s 750 million euro release clause. In addition, Los Blancos became increasingly irritated with the perceived wrangling of the player’s agents, although that hasn’t altered the perception in Madrid that Modric is worth a new contract. Currently running to 2020, the midfielder earns 8m euros per year, some way off Real’s best paid players, with the offer of a four-year contract worth 10m euros net per year on the table at Inter. Madrid accept that these numbers require realignment and, following initial contact between CEO Jose Angel Sanchez and Modric after Wednesday’s training session, crunch talks are due to take place on Friday between the club and his representatives. Following the departure of Cristiano Ronaldo, and given the lack of time they will have in finding a replacement, Real hope to reach a peaceful solution with the Croat’s camp and put this unwanted affair behind them.